What’s the first thing you do when you wake up to an alarm clock blaring in your ears? Fumble around for the snooze button, of course. If you’re one of the many who use their cell phones as an alarm clock, finding the darn thing and then having to figure out where the right button to push is is nearly too much brain power to exert that early in the morning. The Byte Factory has a solution with their new app, Sleep Blaster. Sleep Blaster is an alarm clock that enables you to shut off the alarm by yelling at it. No more fumbling around in the semi-dark! Note that you need a microphone to use this function if you’re using it on an iPod Touch; barring that, you can turn off the Voice Controls for a more traditional snooze button. When setting the alarm, Sleep Blaster tells you how much time you’ll have until the alarm rings. You can set your music as the alarm, or put the app in Dynamite Mode, which simulates the sounds of an explosion. Sleep Blaster can also wake you up once you pass a certain geographical location. Draw a line on the map, and the alarm will go off when you cross it physically. Of course, you need the GPS to be working for the maps to load. Another function is the Sleep Timer, which allows you to fall asleep to either the sound of your own music or to ocean waves. Just set the timer for however long you want it to run, and it will automatically fade out when the clock runs out. Sleep Blaster has a bag full of neat tricks–my favorite being the locational alarm clock–but as it is a third-party app, it does not run in the background. You’d need to keep it plugged into a power source in order to use it. You can only set one alarm, and you can’t adjust the snooze interval; the preset one would make me late to everything, if I jused it. 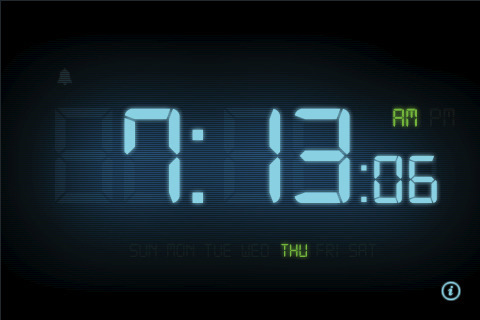 The clock display is a pretty digital one, but nothing you haven’t seen before. This app would probably be better suited for an iPhone user, who isn’t dependent on wi-fi to use GPS or maps, but I’m sticking with my cell phone’s alarm clock for now. AppSafari review of Sleep Blaster was written by Julie Guan on June 19th, 2010 and categorized under App Store, Homes, Travel, Utilities. Page viewed 5574 times, 2 so far today. Need help on using these apps? Please read the Help Page. I have looked at several movie clips this year on youtube and I was really looking forward to this new series. I’m in love!